As a working parent of two young children, it is not easy for me to attend conferences. Thankfully, I have an unbelievably supportive spouse, without which (as you know if you have kids & have voluntarily attended an OOT dev conf), the thought of attending a conference would not even be on the table. Although all 5 conferences were life-changing for me (I now consider many career idols whom I’ve met not only as “real people,” but as real friends; Best profession ever), my work does not pay for events. My knee-jerk reaction was that ThatConference was more expensive for the ticket($350), and about twice as expensive for the Kalahari room as CodeMash ($169 per night in Wisconsin Dells vs $88 per night in Ohio). I could not find a female dev to room with, which essentially made the hotel about 4x more expensive for me (even more, once I decided to bring my 9yo daughter as my roommate & had to pay for her plane ticket). In retrospect, I realize the location was in the middle of a tourist area during prime family travel season, and that the ticket was for 3 days of sessions, while the main CodeMash ticket was $195 for 2 days. Choosing to attend the optional Codemash precompiler (which I did) added an additional $90, which made the CodeMash $285, but I didn’t understand or think about that when trying to decide to go. It would have been MUCH easier for me to make excuses why I couldn’t go than it was to actually make the decision to go. Clark Sell exemplifies what makes the developer community great. When I was first discovering the dev community, meeting him (& others I “just clicked” with) inspired me to be confident being myself. Clark is always Clark, and his confidence, acceptance of himself & others, and enthusiasm for the people in the community profoundly helped me address my own insecurities. I went to show my support for his efforts in this inaugural endeavor. This Tweet does a great job of summarizing the overall theme & feeling of ThatConference, but honestly, I’ve experienced that in the community & this message is a driving reason I love the people so very much… Not to undercut this event in that light in any way; I could go on for days about my appreciation for the team that spent so many sleepless nights putting this on, and the respect I have that CodeMash provided guidance, rather than rivalry. I could rave about the fantastic keynotes by @rubybuddha, @shanselman & @richcampbell. I could talk about how well @alanstevens facilitated the perfectly-located Open Spaces (& how surprisingly great 30 minutes between sessions was for the community aspect). I couldrave about the quality of the speakers & what an honor it was meet & talk to so many I follow on Twitter or whose frameworks I’ve used, but I want to talk about the family aspect, because it was so very cool, different & unique. For example, in the same conference when, during the middle of giving a demo in Posh-Git in the Open Spaces area, I discovered that @dahlbyk (Keith Dahlby, creator of Posh-Git) was looking over my shoulder, I also met his wife & their adorable, blonde, curly-haired, (future-developer?) daughter. In addition, I had the privilege of talking to his wife about bringing tech to youth in the Cedar Rapids (IA) area AND got a walk-through by Keith of how he implemented tab-completion in PowerShell using named regex patterns (something I had just learned about in a great session entitled, “Regular Expressions” by @vongillern a few hours prior to that code walkthrough). How often do you get to see for yourself that @81megs’ kids are even lovelier in person than they are in the adorbale pics she tweets (and see your girls buddying up around laptops); or get to watch your daughter go head-to-head with @tedneward’s son at Burgertime during Game Night (plus meet his entire, wonderful family); or observe @jbogard playfully talking smack with your kiddo? Although my husband & my 6yo did not come to ThatConference this year (largely due to the cost of airfare), I decided to bring my 9yo daughter (when I realized I was not going to find a girl geek to split my room). Sharing this conference experience with her was priceless. It’s no secret that I want my daughters to be nerds (like me). I spent quite a bit of time researching Programming Resources for Kids, but mistakenly stopped exploring it myself when Codecademy came out. Until last week, I intentionally avoided pointing my kiddo(s) to “fake” programming languages because I didn’t see value in learning anything but a “real” language that could actually be used. I’ve been trying since the launch of Codecademy to get my oldest daughter to want to log in & finish her lessons… with no success. I discovered at ThatConference I made a mistake. That discovery alone made the experience priceless for me. To sit in the “Kids Who Code” session on SmallBasic with my 9yo daughter and notice there were THIRTEEN other girls listening with their parents sitting next to them was inspiring (…and CodeProject.com even sponsored pizza, cookies & drinks for the kiddos!). The look on my daughter’s face when she realized she really COULD give a talk to kids on SmallBasic was priceless. The excitement she had, to go use Kodu after her session, was the spark that I’ve been trying to light for so long (and lasted long enough for her to go to the hall to code on her laptop & find out Camp Kalahari was having a “kids cookie frosting” event, but at least that was 10 more minutes than any coding spark I had been able to ignite up to that point =P). Don’t let my focus on kids & family scare or prevent you from wanting to attend. It was a “normal, grown-up” conference in every way (kids weren’t just running amuck or anything). With the exception of game night, 2 kids coding sessions & the closing ceremonies, kids weren’t even around much, that I saw. I focused on the kids aspect because I was seeking it out =). Huh? Where Were the Kids the Rest of the Time? I’m assuming this is where they were, but all I can do is speak for my kiddo. The Kalahari’s Indoor Theme Park is open until 11pm (midnight Friday & Saturday). A one-time $19.95 fee gets you unlimited mini-golf, laser tag, go carts, ropes course, climbing wall, Ferris wheel & carousel for the entire stay. Although I did not let my daughter go to the water park without me, she spent a lot of time while I was in sessions in the Theme Park. (She has a cell phone, and quickly learned that by texting me with every move, her leash was lengthened while I still maintained comfort with her whereabouts. She’s 9 going on 40, though, and I realize most 9yos aren’t as responsible as she is.) After she met other kids at sessions, she spent some of her time with them & their [parents, grandparents]. Meeting the significant others of those who support our Inner Introvert and love us for it (…or in spite of it) really extended the family aspect to me. Our loved ones support our compulsive, mental itches & understand how important it is for us to scratch them when the inspiration hits. I have no idea how my husband tolerates that part of me. He encourages me to challenge myself. His support enables me to face my fears & grow my confidence. It was very cool to meet & talk to the support systems of fellow community members. Speaking of crazy-supportive developer spouses, I have to dedicate this paragraph to Clark’s wife, Carrie Sell. Without her support, Clark (and many others) made it clear this would not have been possible. She was part of the planning committee from the beginning, she handled the venue & the food, and she supported his vision. That vision was insane. Clark couldn’t stop at just throwing the conference. His vision included unique, never-been-seen-before craziness like a pig roast & hand-making (what, 700 of these?) awesome tablet/iPad/slate stands for the attendees. CRAZY. 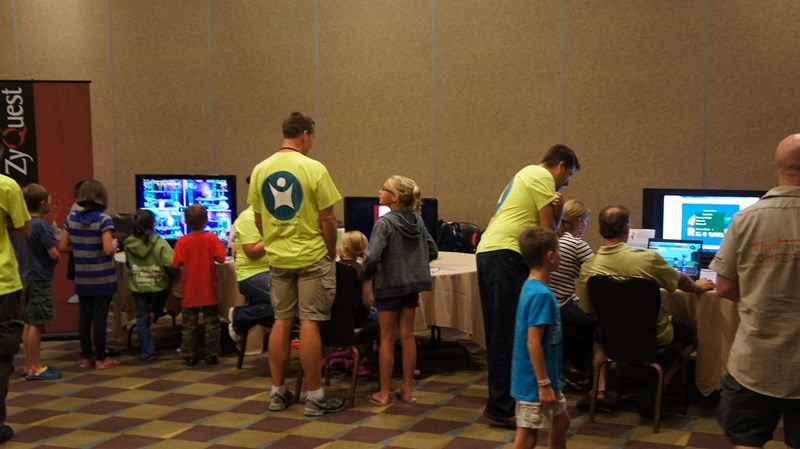 Ironically, they weren’t able to bring their kids with them because they were too busy making ThatConference the huge success that it was to have their own fun, family downtime (AND their kids DID start school that week). Someone described Wisconsin Dells as, “Farm, Farm, Farm, HOLY COW AMUSEMENT PARKS, Farm.” I didn’t even realize Wisconsin Dells WAS a tourist area. Look, it’s true! Yes, it cost me more than Codemash (which I still hope to go to if I can get a ticket before it sells out), but now that I’ve been to both, I understand the reason for the price difference is all about the time of year. Since it is tourist season & most kids are still out of school for the summer, the hotel room cost difference is understandable, and $350 for my ThatConference ticket was a steal (it cost over $600 per person to put it on; Thank you, sponsors)! I came back from ThatConference 2012 PUMPED UP to go again next year AND to make it a family event. Next year, my kids will be 7 & 10 years old. I’m starting to save money now for next year’s ThatConference trip. I even want to go a week early to explore the many tourist attractions in the Dells with the whole family, then stay with my oldest for the conference itself. HUGE THANKS to the many who helped in this massive undertaking. This was truly a great event in a great location in a great time of year, and I am very much looking forward to next year. I still have to chuckle every time I read someone refer to my “farm, farm, farm…” tweet (https://twitter.com/brentschooley/status/234674132602724352). It was spur of the moment but it got a lot of play. Very good summary of the event from a perspective I hadn’t considered very much. I’m engaged, but no family to speak of yet. Fun times ahead! Well, I have to say that I am sorry I could not attend ThatConference. The timing was just off and I’d spent all my points on CodeMash and other events this year. I’m not even going to be able to make it to DevLink this year either. I’ve had a blast attending conferences, meeting people and learning new things. It’s sad that I can’t do that all the time. Somewhere in between, I’ve had to squeeze in family and work. I like that you talked about the family aspect of the conference. Unfortunately, it seems all these conferences are timed such that even if I wanted, I couldn’t take my kids with me due to school schedules. I agree with you about Clark being a great guy and having done quite a bit with putting ThatConference together. I first met Clark at the Midwest GiveCamp he helped organize when he was still with Microsoft. He’s a great dev and all around smart guy. I’ve always enjoyed talking with him but rarely get the chance. I’m glad you got to attend. I was really jonesing to go but it wasn’t in the cards. Perhaps with some planning and extra effort, I will be able to make it to the next ThatConference. Thanks for the great post. (Yes, someday I will get that blog going myself but right now, I’ve got bigger issues to deal with for my son. Strangely, I will be going up to that Khalari Resort are in Sept. Too bad I wasn’t able to coordinate it at the same time of the ThatConference event.) As always, keep learning and staying plugged in. Cheers! Thanks for the great write-up. I didn’t realize how much of a hook the family aspect would be, but we will run with that and keep it important. I was thrilled with the way the “Kids THAT Code” session turned out. I have to thank Carrie for allowing me to last minute plan this … and pizza & cookies always help! Until next year …. ! It was great meeting you at FIRST last Saturday. One of the best things about having kids is watching them get excited about technology, and knowing that you can steer them to cool stuff you never had access to. My dad was an ex-electronics-tech preacher and my mom was a SAHM. When you see the light go off in their eyes you realize just how satisfying it is to raise a productive, polite, responsible, and creative kid. This post was written about my first conference.